Mirroring my Thoughts...! : A recap of June..
June was my birthday month and usually the time I post euphorically on how the day went, but let’s face it guys, birthdays are not fun as we grow older. It is almost like I did not want this day to come so soon. There were gifts, cake-cutting, photos and new clothes, but the thought that I was younger just the previous day is deeply saddening to say the least. On the job front I can figuratively say that I am being sliced and dumped into a blender. My brain now works overtime, and even while conversing with people I have a load of stuff running in parallel in my brain. I am overloaded with work which has reflected in my behavior in the recent past and I am guilty to have pissed off some people. Over a period of time I have turned into a workaholic and I know that because nowadays I dream software codes. To be honest, I am now a complete loser of a wife, mother and friend but a full time consultant and programmer. Anyone who may have gone through this space earlier may know that I am a die-hard fan of SRK. However, yesterday the most unimaginable happened. 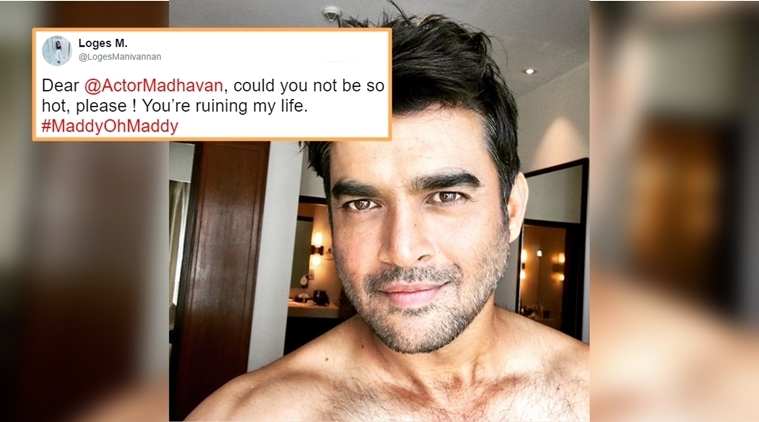 It was a school buddy’s birthday and a friend posted this latest viral selfie of Madhavan in whatsapp group and all of us married women with babies(ya, plural) became sinners and were in blatant violation of one of the Ten Commandments. Such hotness that my phone almost exploded. My parents are arriving this month and very soon, so now I have to throw out unwanted stuff because every time my Mom comes, she brings a portion of Trivandrum with her. My apartment cupboards are already full term pregnant and cannot even accommodate a hairpin. Clearing out stuff from my home is a war scene as all unwanted things seem very dear to the boys who never may have seen those objects until I ask the earth shattering question ‘Do you need this?’ Suddenly they swoop in from nowhere and act like I am throwing away their boxers. Basically nothing is unwanted. It’s time we rent another flat just to keep stuff. And our parents thought that girls were high maintenance they need more space for their accessories and stuff. If anyone reading this has such an idea in mind, you are invited to my house. This is just a sample of what usually happens here. The kind of questions I am asked every minute of the day is baffling to say the least. In general life is going on like usual and I feel like Incy Wincy spider trying to climb up the spout but keep getting washed out by the rain. Unlike the rhyme, in life the sun does not come so soon or may not come at all ,so Incy Wincy bought a new book and is reading under an umbrella hoping the rain will subside. Good thing is, even after your wardrobe culling, Maddy's selfie will still be on your phone driving you mad. Maddy's selfie did me in too ;) That probably was the highlight of my June. Oh what a selfie!!!! I never had any feelings for him, this clearly changes everything!! Maddy!! The same thing happened when I showed the pic to my husband! Seriously he is becoming hotter with age! Gotta lotta wurdz on me blogz.